The James brothers and Cole Younger are part of a band of Southern guerrillas when they learn that Lee has surrendered at Appomatox Court House, so the war is over. Although initially happy to return to their homes, they discover that a railroad company is employing strong-arm tactics to force people in the area to sell their farms to make way for a railroad. When the railroad company’s henchmen kill a member of their family, the James brothers lead their friends to fight back by robbing the banks where the railroad stores its funds. The gang soon becomes famous but the railroad company refuses to back down and intensifies the hunt for the outlaws. To say that the film plays fast and loose with history is an understatement. Quantrill’s raiders, including the James brothers and Cole Younger, had cut through Union troops time after time because they were tough, young men, who carried several Colt revolvers and rode fast horses, while they were going up against second-rate Union soldiers armed with single-shot Springfield rifles and usually walking. 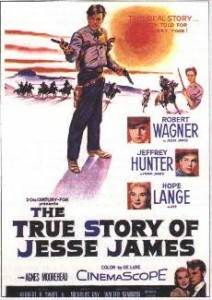 Instead, director Les Mayfield relies on the tried and tested method of having one super-raider, namely Jesse James, kill 20-30 Union soldiers single-handedly. One wonders what the rest of the raiders were for, other than to pick up his coat and empty revolvers. This opening scene sets the tone for the rest of the movie. 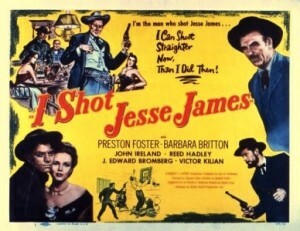 Whenever the outlaws are in trouble, Jesse goes into action mode and kills countless extras in slow-motion as the rest of the gang stands around giving him moral encouragement. 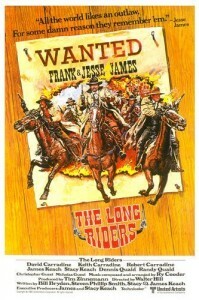 The film completely whitewashes the outlaws, neglecting to mention that the James family owned slaves, and that the outlaws had participated in the raid on Lawrence, where every male was killed, and executed unarmed Union soldiers. Furthermore, they surrendered only because they were beaten, and they remained unrepentant supporters of the Confederacy. The film also tosses in the obligatory competition to be the alpha male between Jesse James and Cole Younger, who are shown as best friends/rivals, even though in reality Frank and Cole were friends, and Cole viewed Jesse as his mate’s annoying younger brother. Oddly enough, the screenplay can’t figure out whether or not to stick to the known members of the gang. Clell Miller was part of the actual gang, Lonnie Packwood is a fictional character, while the idea of a native American as a member of the gang is almost as laughable as the rescue of Jesse at the end of the movie. It is understandable that a number of people had to be cut out for brevity’s sake, including the James’ boys’ step-father, half-brother, sisters, and a fourth Younger brother but couldn’t the writers and the director have at least used the known members of the gang as characters. The inability to obtain loans from the northern-controlled banks to rebuild their farms drove the James brothers and Cole Younger to start robbing banks, and they eventually graduated to railroads. However, the filmmakers apparently preferred to combine the carpetbaggers and the railroads into a single villain, the president of the Rock Northern Railroad, who has the James house firebombed. The screen Allan Pinkerton’s revulsion at the use of terror tactics is an obvious attempt to make Pinkerton look good, but the real Pinkerton had the James’ house bombed in retaliation for the death of several of his agents. For an ex-labor activist, Pinkerton made a successful career out of helping large companies crush striking laborers. In fact, a great deal of time is spent justifying the James brothers and Cole Younger’s decision to pursue a lucrative career of taking other people’s money, therefore they start robbing banks only after their house is firebombed. Despite the numerous historical inaccuracies, the film is a lot of fun, and I have seen it several times. The screenwriter had intended for the film to be shot in a Hong Kong anime style of action, and it is a fast-paced movie, although it is no Hard Boiled. The Robin Hood style approach is to be expected, but it is going a bit too far to suggest that people felt that it was exciting to be robbed by the famous James-Younger Gang. This was before the days of the government-guaranteed bank deposits, so holding up the bank of a small town meant stealing the savings of a community of farmers. Instead of western Robin Hoods, the James-Younger Gang were motivated more by a desire to continue the Civil War, while taking the direct approach to realizing the American Dream. Timothy Dalton carefully researched Pinkerton before arriving on the set, although it does not show on the screen. Actually, the director and the screenwriter wanted Pinkerton to appear to sympathize with Jesse and wish that he rode with the gang, which must have the real Pinkerton rolling in his grave. To be fair, the screenwriters appear to have done a fair amount of research but too much was left out of the film, including Jesse’s never-ending stream of letters to newspapers denying that he was involved in such and such robbery, but he would have been justified if he had been. To the best of my knowledge, this is the only Jesse James film that has a happy ending.